I’ve never really been a subscription box kinda gal, but when Birchbox offered to send me their March Birchbox* I couldn’t decline!. 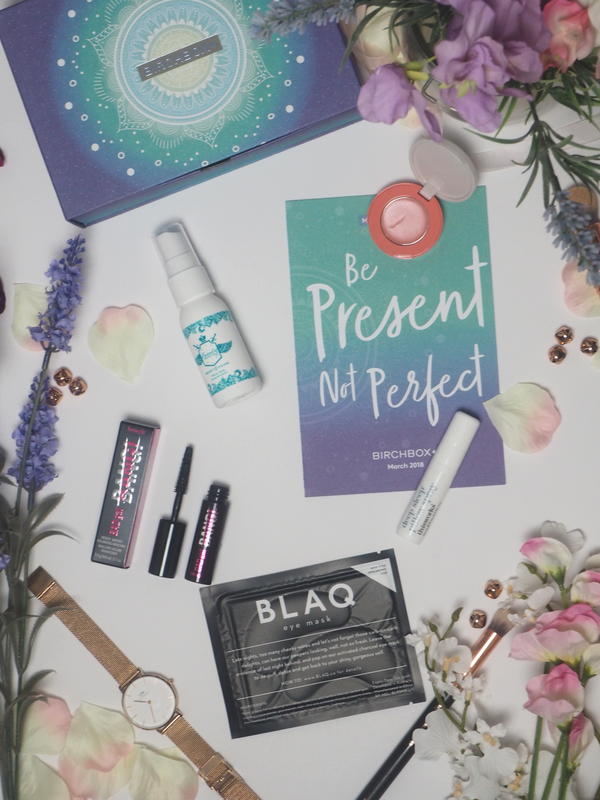 If you haven’t heard of Birchbox, it’s a monthly subscription service full of samples of beauty, skincare and haircare products, featuring a whole range of brands for you to discover. Each month costs £12.95, or slightly less if you choose to buy 6 months or 12 months in bulk. Each month the box has a different theme, with March being mindfulness and self-care. I absolutely love the design of the box, and the theme is so fitting with the topic being so popular right now! My box consisted of 5 items. First up, the most exciting for me, was the Benefit BADgal BANG! Volumising Mascara. If you haven’t heard of this new Benefit release yet, I’m not sure where you’ve been hiding. I’ve been really eager to give this a go, especially after hearing so many mixed reviews. For me, I love the lengthening and volumising effect it has and would go as far to say it’s one of the best mascaras I’ve tried. But unfortunately, I have found it to be a little too clumpy at times. Perhaps there’s too much product on the brush? It’s something I’m going to have to use a few times to really make up my mind on it! Next was the BLAQ eye mask. This is an activated charcoal eye mask, used to get rid of undereye circles and puffiness. I love the idea of this, but I just don’t know how often I’d use eye masks. One face mask a week is a big enough task for me! Nonetheless, I’m eager to try this out to see what results it gives! I love a good sleep spray, and I was excited to see the Deep Sleep Pillow Spray in this months box. I’ve actually bought this for my mum in the past, but it’ll be nice to give it a go myself. The lavender and camomile mix is supposedly the perfect calming scent for an easy night’s sleep. Onto, in my eyes, the less exciting products – LAQA & Co. B’Lighter Blush and Highlighter in Peacher’s Daughter, and Beauty Protector Protect and Volume hairspray. The blush/highlight admittedly is a gorgeous shade, but right now I’m not big on cream products and generally, I’m not on the market for any new blushers right now. I will certainly give it a good try though and see if it’s worthy of a spot in the box. Finally, all I can say for the volumising and protect spray is ‘meh’. I’ll definitely try this out, but I can’t help but feel cheated when I know there were better products sent out in the March boxes. For example, I would love to give a Glamglow mask, or Oribe Apres Beach Wave and Shine a go. Overall, knowing the Birchbox would usually cost £12.95 a month I would definitely give it another go. 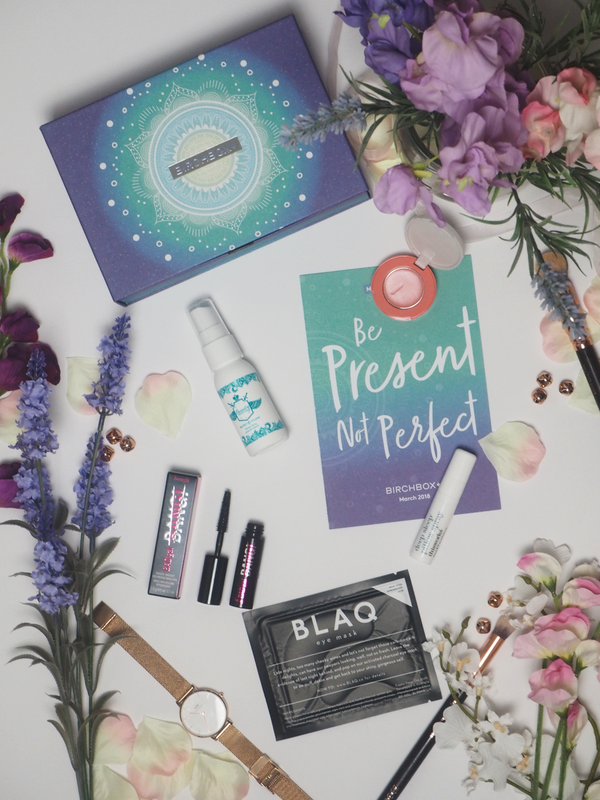 I know it’s simply down to luck in which products you end up receiving and the mascara, eye mask and pillow spray make this box worth it! Have you ever tried Birchbox? This post contains PR samples. This post contains affiliate links. "5 self-care acts you can do today"